This article compares and contrasts chimpanzees and humans, analyzes a number of lesser known genetic studies, discusses relatively unknown aspects of the chimpanzee genome and compares chimpanzees with other animals’ human-like attributes. Chimps look more like us than any other animal. In overall anatomy, they are our closest match. They are intelligent animals, capable of solving problems, making and using simple tools, and passing on knowledge to their offspring. They establish complex social relationships, show special concern for their young, and are self-aware. With the benefit of intense human instruction, chimpanzees have learned some basic sign language and have even been taught crude artistic skills (perhaps). They appear to possess the greatest degree of genetic similarity to mankind. At face value, these similarities seem to corroborate evolutionary notions about human origins. 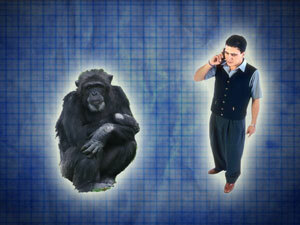 However, there are some extremely significant differences between chimps and humans. Our skeletal anatomy, though bearing some similarity, is very different. Our skulls, necks, spines, limb proportions, pelvis, hands, and feet provide some of the most glaring differences. Our soft tissue arrangements also create a stark contrast in external appearance (e.g., everted lips, nasal bridge, whites of eyes). Some of our protein expression and brain biochemistry are radically different as well. Perhaps the most profound differences come in areas such as language, art, music, mathematics, technology, philosophy, animal husbandry, agriculture, and a moral and spiritual capacity. This is powerful confirmation of the Genesis account in which human beings alone are created in the image of God. We are not highly evolved apes. Although we are frequently told that chimps and humans share between 98–99% of their DNA, a number of studies reveal a smaller percentage of similarity. A 2002 study in the Proceedings of the National Academy of Sciences (PNAS) analyzed about one million DNA base pairs and discovered an approximately 95% similarity.3 The human genome is composed of about 3 billion base pairs, so this comparison involved less than 1% of the genome, but it was of sequences already considered to be common to chimps and humans (‘homologous’). A 2003 study, also in the PNAS, compared about 1.9 million base pairs in immunologically critical areas of the chimp and human genomes. This study took into account insertions and deletions (indels) and derived a low 86.7% similarity.4 When the chimpanzee genome was mapped in 2005, scientists announced a 96% similarity.5 Another study, in 2006, revealed a 94% genetic similarity.6 Obviously, these results are all considerably lower than the still widely touted 98–99% statistic. These different studies reveal that the degree of genetic similarity is highly dependent on the particular regions being analyzed, the amount of DNA being compared and the computational techniques used. The 2006 study claiming a 94% similarity creates a big problem for evolutionary geneticists who just sequenced the Rhesus macaque genome and declared a 93% DNA similarity between these monkeys and human beings.7 It is highly problematic because these monkeys supposedly branched off from our common ancestor about 25 million years ago, while chimpanzees supposedly diverged about 6 million years ago. So we have supposedly diverged from chimps some four times faster than we have diverged from Rhesus monkeys. Simply stated, there should be a more significant gap between humans and the monkeys if evolution and its dating were true. First, the chimpanzee genome was not built from scratch. In a likely bid to save money and time, it was assembled using the human genome as a scaffold. This also reveals the evolutionary presuppositions of the scientists who started the genome project with the critical assumption that humans and chimps are close evolutionary cousins and would tend to bias the results towards greater similarity. Second, the chimp genome is about 12% larger than the human genome. At the risk of sounding overly simplistic, this would seem to indicate at most an 88% DNA similarity from the outset. How was this 12% difference taken into account in the overall percentage similarity, or was it ignored? Third, chimpanzees possess many genes not present in the human genome. They also lack many genes that are present in the human genome. How were these differences included, or were they? Fourth, by evolutionary reckoning there were millions of ‘rearrangements’ in the chimp genome. How did scientists calculate this dissimilarity? These are exciting questions for creationist geneticists to investigate without the constraints of the stifling evolutionary paradigm. It is quite possible that improved technology and further research into these critical areas of the chimpanzee genome will reveal even more substantial differences. Last year, scientists discovered that bats and horses shared a higher degree of DNA similarity than cows and horses—see Saddle up the horse, it’s off to the bat cave. You could hardly find two more distinct placental mammals than bats and horses, yet in contrast to evolutionary predictions based on comparing anatomy, they shared a greater genetic similarity than did horses and cows. This may have major implications for the chimpanzee-human DNA similarity as well. Despite possessing some common anatomy and a high percentage of DNA, chimpanzees are radically different from human beings in a significant number of ways. They are also rivaled and even surpassed by numerous other animals in human-like attributes such as intelligence, linguistics, emotional and social capacity, and behavioral compatibility with mankind—see Primates spearing primates. Despite chimpanzees sharing significant genetic similarity with humans, we rely on a whole host of other animals to perform vital tasks such as searching for mines and bombs, transporting large quantities of cargo and supplies, and aiding the disabled. In addition, chimpanzees have been the recipients of countless hours of intense human training and conditioning, yet they remain quite disappointing in their human-like capacities. All of this contrasts strongly with the claimed high degree of DNA similarity and superficial anatomical similarity. Lemonick, M. and Dorfman, A.. What makes us different? Time, http://www.time.com/time/magazine/article/0,9171,1541283,00.html. 1 October 2006. Return to Text. Wood, Todd. The Chimpanzee Genome and the Problem of Biological Similarity. Occasional Papers of the BSG. Number 7. 20 February 2006. Return to Text. Brittin, R. Divergence between Samples of Chimpanzee and Human DNA Sequences is 5%, Counting Indels, Proceedings of the National Academy of Sciences, USA 99 (2002): 13633–35. Return to Text. Tatsuya, A., et al., Comparative Sequencing of Human and Chimpanzee MHC Class I Regions Unveils Insertions/Deletions As the Major Path to Genomic Divergence, Proceedings of the National Academy of Sciences, USA 100 (2003): 7708–13. Return to Text. Boyle, A., Chimp genetic code opens human frontiers. MSNBC Science & Technology, http://www.msnbc.msn.com/id/9136200/ 01 September 2005. Return to Text. Minkel, J.R., Human-Chimp Gene Gap Widens from Tally of Duplicate Genes. ScientificAmerican.com, http://www.sciam.com/article.cfm?articleID=9D0DAC2B-E7F2-99DF-3AA795436FEF8039. 19 December 2006. Return to Text. Choi, C., Monkey DNA points to common human ancestor. Livescience, http://www.livescience.com/humanbiology/070412_rhesus_monkeys.html. 12 April 2007. Return to Text. E-mail communication with creationist geneticist Dr. Rob Carter. Return to Text. Batten, D., No joy for junkies, Journal of Creation 19(1):2, 2005. Return to Text. Sodera, V., One small speck to man. Vij Sodera Productions, UK, 2003, p. 386. Return to Text. Ref. 10. p. 424. Return to Text.